Agronomic practices, climatic variables, and soil conditions are key factors in crop productivity. Although the effects of soil chemical properties and water and agronomic crop management are known, there is little information about effective soil depth and its influence on crop productivity. Since most crop fertilization systems are based on the productive potential associated with climatic conditions and chemical properties of the first 20 cm of soil depth, the objective of this study was to determine the importance of effective depth in terms of increasing fertilization rates on durum wheat ( Triticum turgidum L. var. durum) productivity. Two experiments were conducted in the 2006-2007 season in the Santa Rosa Experimental Station (71°54’ S, 36°31’ W, 220 m a.s.l.) 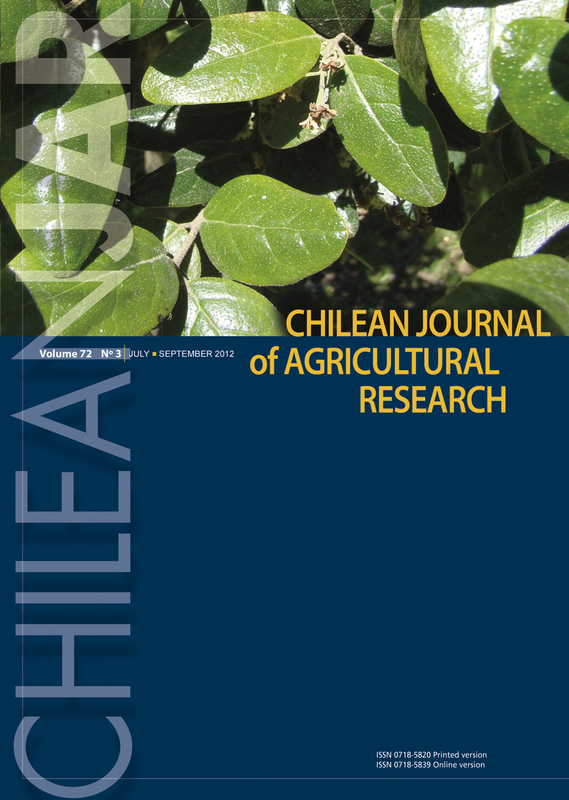 of the Instituto de Investigaciones Agropecuarias (INIA) located in south central Chile. We used the hard wheat cvs. Llareta-INIA and Corcolén-INIA because both respond differently to soil physicochemical properties. Each cultivar was sown in sectors with different depths: 1) 0.45 m depth, silt loam on river material and 2) 1.0 m depth, loam on deep sediments. Fertilization was: 1) control without fertilization, 2) basal fertilization (BF) based on P, K, Ca, Mg, S, B, and Zn plus 90 kg N ha-1, and 3) BF plus 210 kg N ha-1. Grain yield, plant height, and number of stems m-2 were positively affected by increasing depth of soil profile. The increasing fertilization rate affected grain yield and plant height. Grain yield for cv. Corcolén-INIA had a greater response than cv. Llareta-INIA when soil depth was increased.